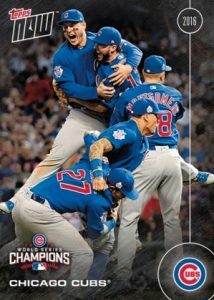 Showcasing the real strength of the Topps Now program to quickly deliver notable moments on cardboard, 2016 Topps Now Chicago Cubs World Series Champions Team Set allows fans and collectors a near-instant option to celebrate the historic moment. Basically an offshoot of the massive Topps Now Baseball set, the 2016 Topps Now Chicago Cubs World Series Champions Team Set brings a total of 15 cards for key Cubs players in a commemorative 2016 World Series release. The online exclusive includes a team card and a special MVP card for Ben Zobrist, as well as base versions for Kris Bryant, Anthony Rizzo, Kyle Schwarber, and many others. Available for just one week through the Topps site, 2016 Topps Now Chicago Cubs World Series Champions Team Set sells for $49.99. Bulk pricing drops the set cost with ten-set bundles going for $399.99. Free Smart Post shipping is included in the purchase. In addition, another version features an extra card that is signed. 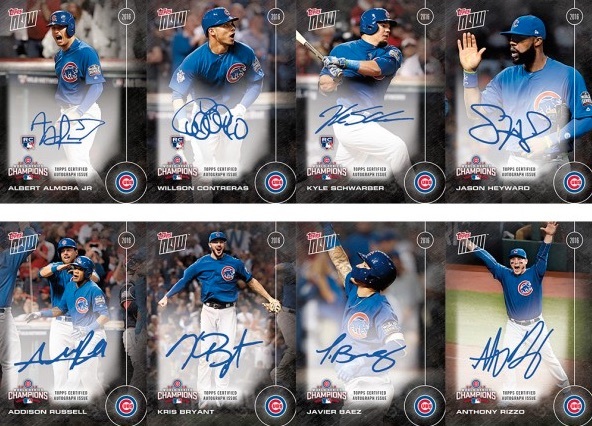 So, collectors will find the full 15-card set plus an autographed card for one of the eight Cubs included. These more limited sets cost 149.99. While most sets will contain a base autograph, there is also a shot at numbered parallels which are randomly inserted. 15 cards. Shop for Cubs Now WS sets on eBay. Final print run = 6,636 sets. 8 cards. Only found in Autograph Edition set. Specific box odds noted below. Final print run = 2,581 sets.